Some great achievers just know from within that they are talented and don’t need to be told by the world that they are among the finest! When you meet Dr MG Bhat for the first time, in just five minutes you realise that you are meeting a self assured man whose persona exudes a confidence that only a seasoned surgeon would posses. As a journalist I always crave to interview prominent surgeons, for the sheer desire to know what lies beneath that splendid mind which handles the pressure of dealing with life and death daily, and still operates with great precision and hope. So, I jumped at the opportunity to interview Dr MG Bhat, a name taken with respect in the surgical fraternity. With more than 5,000 laparoscopic surgeries to his credit and over three decades of vast surgical experience, he requires no introduction. Dr Bhat was also a pioneer of laparoscopic surgery in the state of Karnataka, his birth place. With his large surgical experience in hospitals like Manipal and Wockhardt, he is today regarded as the finest general surgeons with extensive experience in complicated gastrointestinal surgery and laparoscopy surgery. Today, as a Medical Director of NOVA Medical Centres, and a Consultant Surgeon, GI and Laparoscopy at Wockhardt Hospital, Bangaluru, his hands are full. The seeds of success are always sown in the childhood. So, how was he as a child? “I was always a good student in school as well as college. In medical college too I managed my studies pretty well. I was a student president and used to participate in all the sports and was considered an all rounder,” shares Dr Bhat, one afternoon sitting at NOVA Medical Center in Bangaluru. His father being a general practitioner at Hospet in Karnataka, he was naturally driven to the career of medicine. A turning point in Dr Bhat’s life came when this small town boy from a conservative Brahmin family, got the taste of unbridled freedom as he entered his college life. “I totally lost concentration from my studies. I just freaked out with focus shifting to being free. I had a gang with whom I used to do ‘dadagiri’,” he says. It reached a point where he was on the verge of being thrown out of college once for breaking a hostel door! However, after that incident, self realisation that he was treading on a wrong path dawned on him. “I realised that this is not the way I wanted it to be. There was a total transition in me from that day onwards, and as they say, I have never looked back since then,” he recollects. He was getting admission in the same college for a medical seat, but he wanted to completely forget this incidence, and therefore, purposely took admission in Kasturba Medical College in Manipal from where he did his MBBS and post graduation. As a self-confessed perfectionist and a result-oriented person, the excitement of opening a human body, repairing it and getting immediate results thrills Dr Bhat till date. No prizes for guessing that he chose general surgery as his specialisation for post graduation. “In 1976, when I did my post graduation, there were not many specialisation options available as they are today. General surgery was vast and I thought that I will be able to do lot of surgical work.” He met his wife Dr Jaya Bhat at KMC where they pursued post graduation together. Both he and his wife worked with KMC for a year. “In surgery, the experience comes only through operating, which only happens once you are through with your post graduation. I was a good student and got an offer to work with KMC. 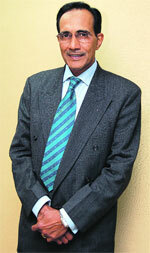 I was not sure about my next career move and this one year gave me the time to decide,” says Dr Bhat. His next destination was the UK where he worked with Liverpool Hospitals from 1978 to 1983. There was an opportunity to settle down in the UK, however, Dr Bhat wanted to come back. Did the feeling of serving his own country bring him back? “I can’t really say what exactly triggered this decision to come back. I had this inclination to come back while my wife was keen on staying back,” he says. It was hard to return and settle down with no capital in hand. As a foreign returned, he was supposedly viewed to have a lot of money. But that was not the case with Dr Bhat. He came back to India on a short trip in 1982 just to find out whether he can really come back and settle down. “Bangaluru was a totally new place for me and I had no capital,” he remembers. Only to generate some capital he did a short stint in Riyadh, Saudi Arabia, for three years, where he worked with Central Hospital as a specialist in surgery. Born on 27th July 1948, Dr M G Bhat was born in Hospet, Karnataka. 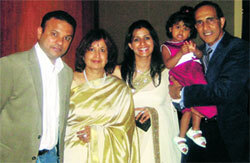 He got married to Dr Jaya Bhat, an experienced obstetrician and gynaecologist. “My wife has been the greatest support of my life. She has been a force probably to drive me in doing various things and gave me the support when I needed it,” shares Dr Bhat. Has one daughter Dr Gauri Bhat who is also a doctor and stays in Scotland. He loves to travel to Scotland to meet his daughter and especially his three and a half year old grand daughter. Not an avid reader, the recent book that he read was ’5 Point Someone’ by Chetan Bhagat. He used to play cricket as a medical student. Today, he is keen on pursuing his interest in golf. With no contact besides an old uncle in the garden city, Dr Bhat started his journey without any support system. “Wherever we went with a hope to get a clinical attachment with the hospital, we got only shallow appreciation but no work,” remembers Dr Bhat, of the early days of struggle. But, fate had different plans for him. Things started looking up when he joined MS Ramaiah Hospital. Slowly and steadily he expanded his network of attachments with different hospitals. “I was lucky enough to be able to establish myself in a short span of time.” Dr Bhat believes that sheer hard work, his workaholic nature and the hunger to be the best have been the triggers for his successful career graph. 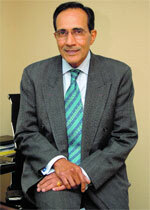 It was at Manipal Hospital that his surgical career surged newer heights. “I was involved with Manipal Hospital since the time the foundation of the hospital was led in 1986.” The hospital stated in 1991. He served as a Head of Department of General Surgery at the hospital form 1992 to 2005. He had a special interest in surgical gastroenterology, especially hepatobiliary pancreatic surgery and laparoscopy surgery. This was the time when in 1992, after coming back from a conference in Delhi on laparoscopy surgery, Dr Bhat introduced this technique in Manipal Hospital. Even after his fallout with the hospital administration, Dr Bhat still fondly remembers his association with the Hospital. “I have very good memories of Manipal Hospital, which is an amalgamation of corporate, social as well as educational views. I don’t think there is any other institution which can see such a wonderful meeting of all the three important pillars of healthcare coming together,” he says. Then what made him part his ways with such a great institution? Ideological differences with the administration triggered his decision to leave the hospital. “I felt that the old culture was disappearing and they were looking for something else. I got a feeling that they did not need me anymore,” shares Dr Bhat. These days, Dr Bhat is mighty excited about his new role as the Medical Director at Nova Medical Centre, a day care surgical facility and a chain of ambulatory surgical centres started in Bangaluru. The centres focus on outpatient surgeries, with no overnight patients. “What made me interested in Nova was the concept which is fairly new,” he says. Seeing a question mark on my face as to how day care surgery is considered new in India with multiple players already in this space, he explains, “The day care surgery concept itself is not new but a day care center as an independent stand alone centre is a fairly new concept.” In such a day care centre, selection of the patients is very crucial and the biggest challenge for me as a medical director is to motivate patients to come to this centre as well as convincing surgeons that day care surgeries are possible. Dr Bhat does his homework to the ‘T’ as a surgeon. Well, the same was reflecting when he started talking animatedly about the day care surgery concept and its business potential. “This is ‘the’ concept today where with all the newer technology coming in, I thought that I can promote, develop and show that it is something which can grow into a speciality in itself with 60 to 70 per cent of surgeries can be done as day care,” he adds. With low capital investment and charging 10 to 15 per cent less than corporate hospitals, this concept is the next big trend, he asserts. Awarded Blue Ribbon gold medal 1972 as a best outgoing student of Kasturba Medical College, Manipal/Mangalore. Dr TMA Pai Gold Medal and Blue Ribbon awarded for obtaining the highest marks in the medical career. Lifetime achievement honour given by the Kasturba Medical College during the Diamond Jublee Celebrations of the College in Jan 2004. There is an old saying that ‘a good surgeon operates with his hand, not with his heart’. For Dr Bhat, it is the heart which sometimes helps him take a very tough surgical decision at the time of crisis. “When I am about to take a decision on an operation table, I imagine the patient at the place of my closed ones and take the best decision possible,” he says. With so many successful operations to his credit, what has been his formula to sure shot success each time he operates? “I analyse a lot. In fact, I have records of each and every surgery since the time I did my first surgery in 1976. I look at my own mistakes and correct myself the next time. I have done a lot of self training like this,” he shares. Since the time he was a student, Dr Bhat always enjoyed teaching. 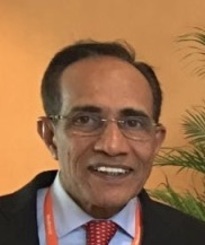 Not as a teacher in a medical college, but he has trained and taught many surgeons the nitty gritties of surgical techniques under his guidance in corporate set-ups. “People tell me that I have a good ability to express myself. I like this idea of knowledge dispersion too,” he avers. His second area of interest is medical ethics which he developed when a family of a diseased patient of his filed a court case against him for negligence. “This was an old high-risk patient who was refused to be operated in few places. I took up the case and did the operation. Unfortunately, the patient did not survive. Just before he died I was out of station. A lot of confusion was created and the relatives felt that I was negligent, completely suppressing the fact that he was unfit and on wheelchair,” he explains. This incident annoyed him and he took a decision to do something about it. He did a Diploma in Medical Law & Ethics by National Law University, Bangaluru in 2000. Not only this, his dissertation on ‘Problems while dealing with elderly patients’ was published in the University journal as a separate chapter. He also did a Diploma in Medical Informatics in 2003 from Royal College of Surgeons of Edinburgh. “I found the concept very interesting,” he says. His surgical career actually took a backseat for two years as the course was demanding and needed intense reading. Post this course, he also toyed with an idea of doing an MBA! “I wanted to get into administration at that point in time. I already had done law and informatics and just needed a degree in administration. However, I did not pursue it as I felt that age is a bar with so many youngsters getting into administration,” shares Dr Bhat. “Life has been good and God has been kind to me so far,” Dr Bhat says humbly as he looks back at his professional journey as a surgeon. With an experience of more than three decades of doing many complex and difficult surgeries, now he wants to slow down a bit and take it easy in life. However, don’t mistake it with an early retirement. “I am slowly trying to come out of the complex work and keen on doing more straight forward surgeries,” he says. After going through the pressures of doing complex procedures for so many years, now he wants to diversify to medical administration. “I would love to do the administration of the medical staff,” he adds. With age, work efficiency is blunted, is what he feels and doesn’t want to continue surgical work after the age of 65. He avers, “I feel that as a surgeon one needs to be completely in control-both physically and mentally, when you operate, because your results are directly proportionate to the efficiency you have. I am in perfect health right now, but it is difficult to say how it will be after the age of 65. So, I still have three years to go!” Till that time, he is happy operating at Wockhardt and giving a strategic thrust to Nova.